The public sees this basic principle as the most important issue, even beyond the particular pending religion-and-state conflicts. The voters attach “great importance” to the specific issues in the following order of priority: Operation of public transportation on the Sabbath; Recognition of civil marriage and divorce; Enlistment of yeshiva students; Cutting the allocations for yeshivas and religious institutions. Equality for the non-Orthodox streams and women’s prayer at the Kotel enjoy majority support but are at the bottom of the priority list. Hiddush maintains that continued capitulation to the dictates of the ultra-Orthodox parties harms the state and contradicts its basic values. Hiddush surveys show that those who promote freedom of religion and equality will receive increased voter support, but most of the parties still betray their constituents and ignore the public’s will and at best offer crumbs instead of overhaul and transformation. 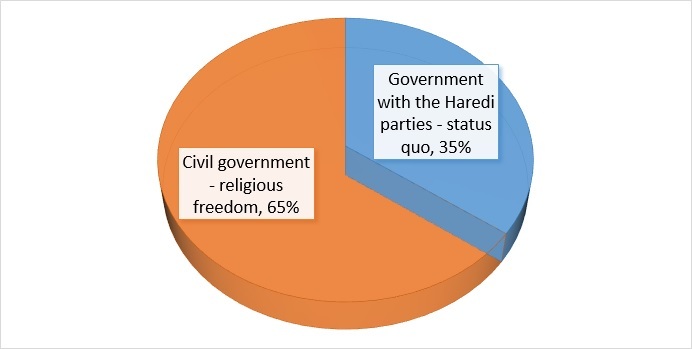 Twenty days before the Knesset elections, the public's desire for a civil government, independent of the Haredi parties, which can promote freedom of religion and equality of civic burden, was re-affirmed in a special poll conducted by the Smith Polling Institute for Hiddush – Freedom of Religion for Israel; 65% of the adult Israeli Jewish population supports a civil government that is required to advance religious freedom and equality. Only 35% support a “unity government” with the ultra-Orthodox parties based on maintaining the “status quo” in the realm of religion and state. These results [reflecting those in the sample who expressed an opinion] confirm the findings of the survey conducted for Hiddush in February [63% / 37%] and the findings of additional surveys conducted on this subject over time. Among those who support the establishment of a civil government are: 80% of secular Jews, 79% of those who are ‘traditional – not so close to religion’, and 58% of those who are ‘traditional – close to religion’. 31% of the Zionist Orthodox community also supports this. Those who support a “unity government” with the ultra-Orthodox parties, on the basis of the “status quo” include: 81% of ultra-Orthodox Israeli Jews, 69% of Zionist Orthodox, 42% of those who are ‘traditional – close to religion’; but only 21% of those who are ‘traditional – not so close to religion’ and only 20% of secular Israelis Jews. 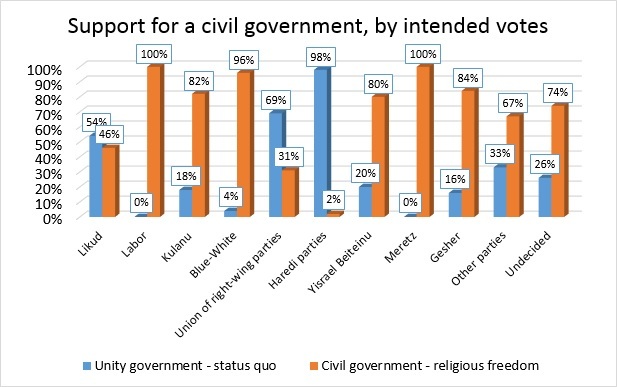 Following is the distribution of respondents’ views according to the parties they intend to vote for in the upcoming elections: 96% of likely Blue and White voters favor a civil government, as do 100% of Labor party voters and 82% of voters for the Kulanu party. Nearly half (46%) of likely Likud voters also prefer a civil government. The issue that the respondents attached “most importance” to in terms of their hope that the party they support would advance, is the overall principle of freedom of religion and equality of civic burden, beyond any particular issue on the public agenda today. [35% see this as very important for them.] Particularly striking is the fact that 60% of Blue-White voters see this as the most important issue! The concrete issues in the realm of religion and state, according to the order of their importance to the public, are; allowing public transportation on the Sabbath; recognition of civil marriage and divorce; and more. Only 27% of the adult Jewish public replied that none of these issues mattered to them or that they had no opinion on the subject. [Respondents were asked to select up to 3 subjects that are "very important to them" in their desire to see them advanced by the party they support, and therefore these results are cumulative and amount to more than 100%]. The survey also examined the relative importance of equal recognition for the non-Orthodox denominations [Reform and Conservative, for example], as well as the struggle of the Women of the Wall for the freedom to pray and read aloud from a Torah scroll in the Western Wall plaza. The findings clearly indicate the public’s priorities. It should be emphasized that most of the Jewish public supports the equality of the status of the non-Orthodox streams and the rights of the Women of the Wall. In Hiddush’s 2018 Israel Religion and State Index, 66% supported granting equal status to all major streams in Judaism. A comparable percentage supported the right of women to read from the Torah at the Kotel in a 2017 Hiddush poll. But this support is at a low level of intensity and is of relatively low importance compared to matters such as public transportation on the Sabbath, freedom of choice in marriage, enlistment of yeshiva students and gender equality in the public sphere. 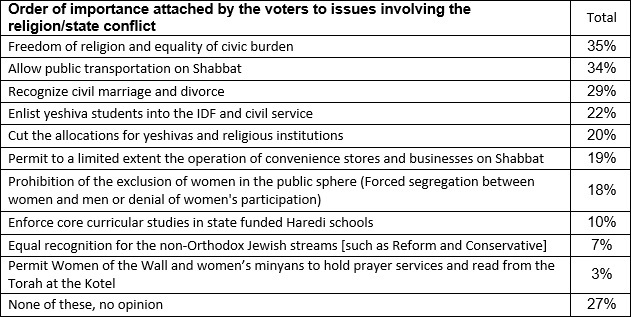 While 34% respond that allowing public transportation on the Sabbath is “very important” to them, and 29% - the recognition of civil marriage and divorce, only 7% feel similarly about the granting equal status to the streams, and only 3% - allowing the Women of the Wall and other women’s prayer quorums to pray and read Torah in the Western Wall plaza. Based on systematic, long term polling that Hiddush conducts, it is clear to Hiddush that the public wants deeds rather than words, a real policy change rather than offering just more dialogue. The statements made by the leaders of Blue and White on a potential agreement they may strike with the ultra-Orthodox parties after the elections runs contrary to the expectations of their own constituency. The party’s leader, Benny Gants recent leaked speech to a party small forum, in which he said he would give the Haredi a blank paper and invite them to fill up 2/3 of it with their demands [and receive them], and he would fill in the remaining 1/3. These indications are in complete contradiction to the will of their potential voters, and that of the general public. Even among Likud voters, there is strong support for the principles of freedom of religion and equality of burden, as well as for permitting public transportation on the Sabbath, introducing civil marriage and divorce, and the recruitment of yeshiva students to the IDF and civil service. It is clear from Hiddush’s systematic surveys that the Likud turns its back to its voters on these issues, nor does it represent the general public’s will. The principle of freedom of religion and equality of burden is unfortunately absent from the platforms of most of the parties. A surrender to the dictates of the ultra-Orthodox parties, which has thus far been reflected in the election campaign, harms the state and contradicts its basic values. Hiddush surveys in recent months show that those who promote freedom of religion and equality will receive increased voter support. Regrettably, most of the parties continue to betray their constituents and ignore the public’s will, settling at best to offer crumbs and partial isolated changes rather than the long awaited for overhaul and transformation in the relationship between religion, state and politics. The survey was conducted via phone interviews on March 17-18 among a sample of 600 participants, which represents the adult Jewish population of Israel [Possible sampling error ± 4%].